A cacao fruit hanging from a tree at Silico Creek, Panama. Rain pelted darts of moisture into my skin as we stumbled off the bus into a huddle of quizzical faces. Their complete bafflement signaled a slice of doubt in my mind as the bus handler hurled our luggage under the shelter and sped down the road, leaving Ana, my dad, and me at mile marker 25: Silico Creek. Barely on the maps, Silico Creek is a blip on the tourist radar between Bocas del Toro and Boquete, but my dad discovered this indigenous community in his research and decided we three would kick off our Panama adventure learning about the origins of chocolate through Urari, a small rural tourism organization at Silico Creek, which lies within the Ngöbe Buglé Conmarca, a demarcated area similar in function to the Native American reservations in the US. 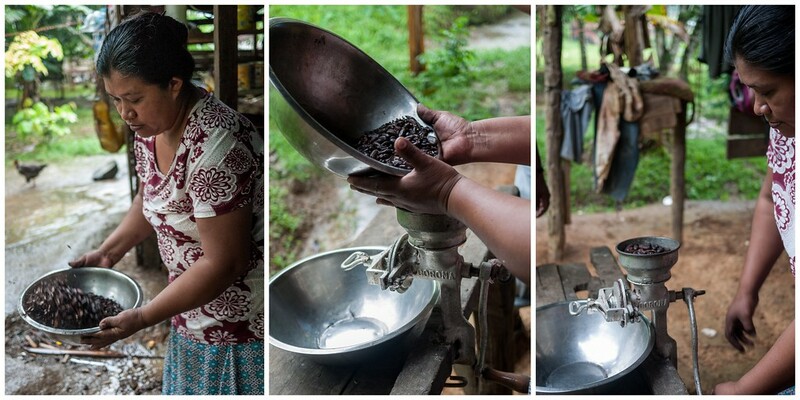 From the start, our adventure echoed of the coffee journey Ana and I visited in rural Thailand to learn about fair-trade, sustainable coffee production. If there is one thing I love more than coffee, it’d be chocolate, so this journey with my dad and Ana would round out my understanding of two of the world’s biggest food commodities. Like coffee, eco-tourism circles bandy about buzz-ish words like “local,” “organic,” and “fair-trade.” A trip to the designer chocolate aisle at the grocery store is a veritable test of each company’s ability to find marketable synonyms of these words. But I wanted to know the human story behind the chocolate and Urari’s small tourism organization, self-started and run entirely by the community, seemed like the perfect place to delve into my two great loves: supporting social enterprises and consuming chocolate. In short, our weekend held promise and we were all intrigued by the chance to live within the community … but first, I had to find the place. 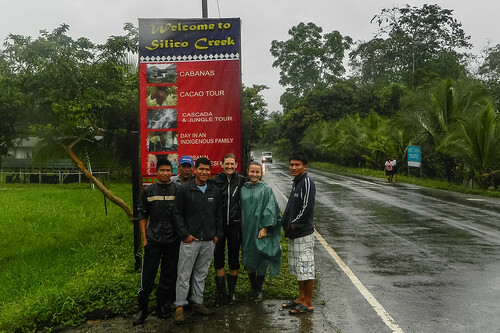 I hesitantly questioned the group in Spanish, and big smiles bloomed on their faces as they gave encouraging gestures toward the gravel path behind us, nodding as we set off into the drizzling rain. Two hours later, we had settled into our modest wooden hilltop bungalows, consumed hot chocolate, and found ourselves surrounded by members of the community—everyone asking and answering questions in tandem. The rain cleared for part of our stay and our first sunrise welcomed a gorgeous, crisp day of blue skies and chirping birds. 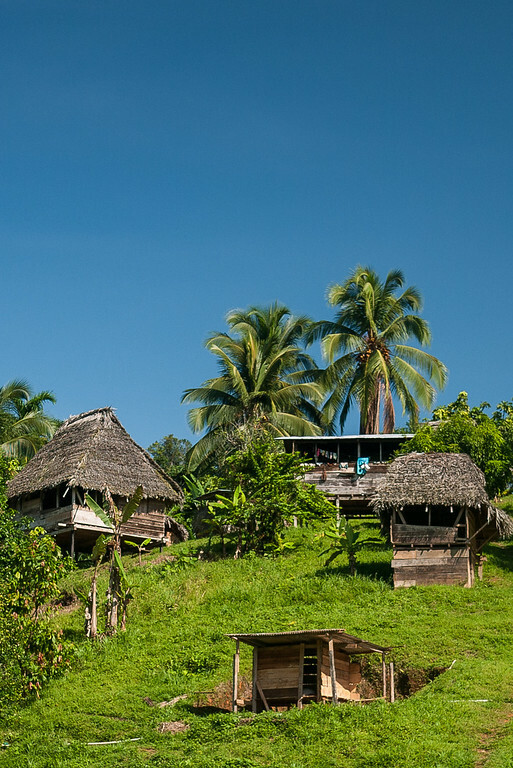 Modest wooden houses line the hilltops with gorgeous views all the way to the Caribbean Sea. Right away, our biggest hurdle was language … only a few members of the community speak basic English, so as the guides and members of the community learned that each of us had varying levels of Spanish, mine being passable to communicate, we defaulted to Spanish and spent three days in full immersion, with me acting as translator for Ana and my dad. Immediately digging into the immersion, we learned of the community’s history. 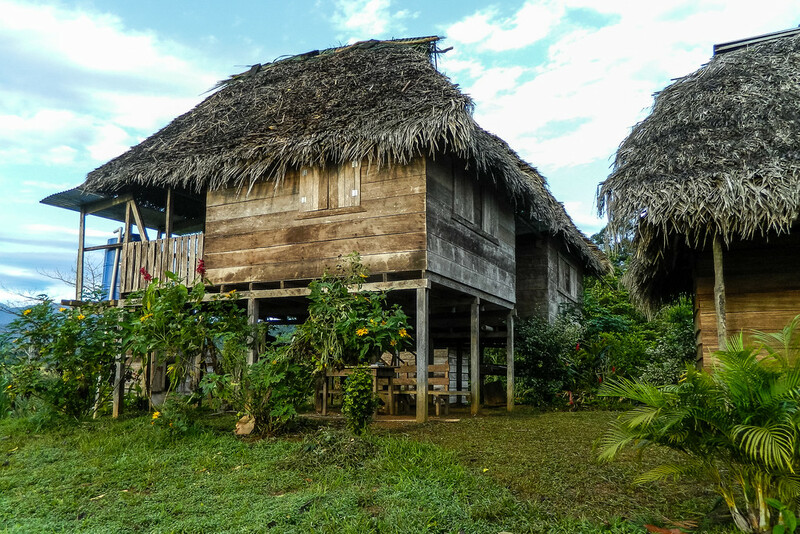 Silico Creek is a settlement of indigenous people who moved to a fertile northeastern region of the Ngöbe Buglé Conmarca in the 1960s—that first family expanded and the 500-person village now includes all the children, grandchildren, and extended relatives. Urari, I learned, is primarily set up to become the community’s home-grown solution to tourism and income. Much like reservations in the United States, the indigenous population is given land and the right to operate freely, but in contrast to reservations in the US, demarcated regions of Panama are given almost full autonomy and therefore lack government support. This was not always the case though, and after years (decades … centuries) of politics and land issues, modern tourism and the development of a thriving economy is tough for rural communities. Many indigenous peoples operate on a barter system and internal economy within the community, but the world encroaches on the edges of the reservation land, and land within the demarcation has become a commodity for the Ngöbe Buglé. As we learned more, I related it back to my time in Thailand studying coffee. Many issues I found in coffee production Thailand are similarly present in Silico Creek’s cacao plantations. 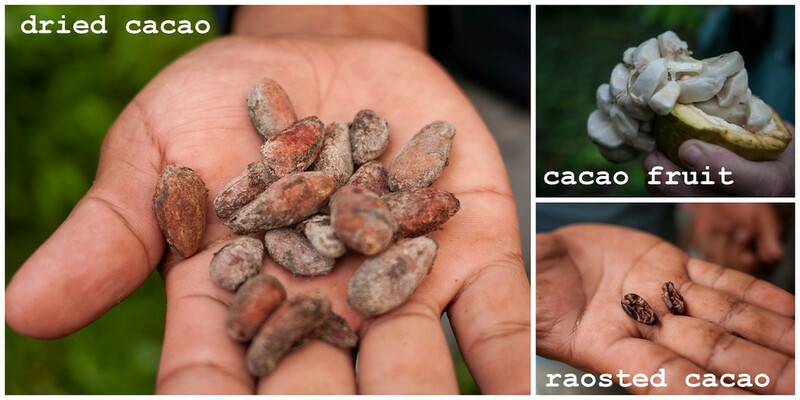 Cacao is the primary crop grown by nearly every family, but they sell their beans to a cooperative nearby that, while paying “fairly,” does not generate enough income to support the community. In short, the current avenue for selling their cacao outside of the reservation isn’t livable wages even within their communal living system. Hence their focus on tourism. And in this case, it’s home-grown tourism that Ana, my dad, and I were taking part in as Silico Creek formed Urari, which operates the several tours and overnight stays for foreigners interested in learning more about the Ngöbe culture as well as organic agriculture and cacao production. 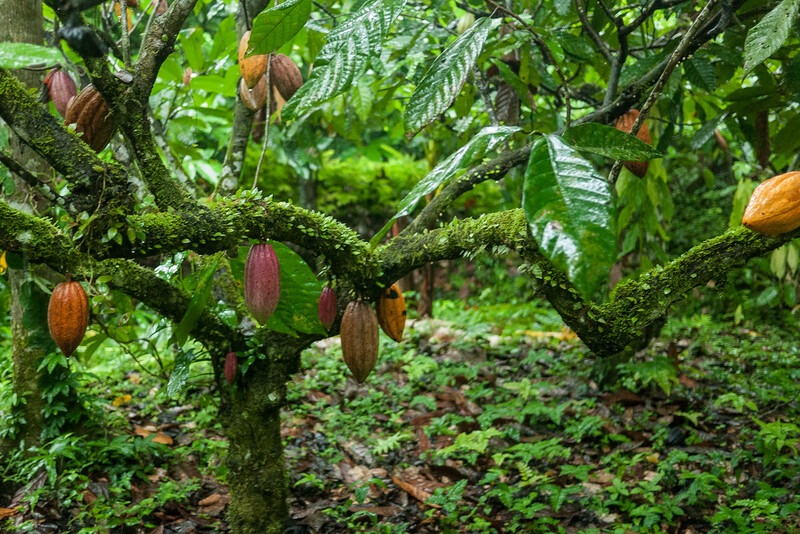 The largest initiative at Silico Creek of interest to outsiders is organic farming and the production of cacao—the plant at the beginning of all the world’s delicious chocolate. We spent our first afternoon at Urari learning about the culture and people within the settlement, but as dark settled over the hilltop bungalows we were given a cheery wave as the community descended to their homes just below, navigating with cell phones as flashlights since the community does not have electricity. And then it was an hour of the small pleasures—my dad and I talked on the our dark balcony, looking out of the moon-washed treetops and discussed the day. Ana hunkered under the mosquito net and read a book inside, at least, she read until I ousted her at top speed to see the flickering tapestry of fireflies breaking up the dark near our bungalows. Until traveling I had never seen a firefly, so I knew that was Ana’s fate as well. She and I did a lively rendition of Owl City’s “Firefly” before we all turned in for an early nights sleep. We woke to the chatter of birds the next morning and the smiling faces of Eduardo and his family as they laid out a full breakfast spread—traditional bread, eggs, and fruit—a meal hearty enough to get us through the strenuous waterfall hike on the docket for the day. And boy did we earn that breakfast; the hike was muddy and fun and gave us the chance to grill Arnoldo—our guide and brother to Eduardo—about the backstory of the Ngöbe Buglé people, the community’s ultimate goal for Urari, and the impact of Panama’s varied political past. 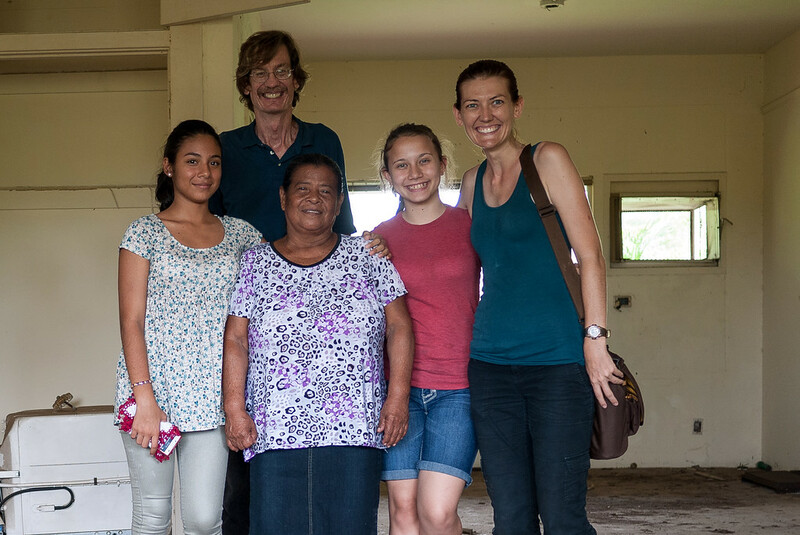 Our second day with the Silico Creek community ended as had the previous day, many members of the community came to our hilltop bungalows to visit and answer questions (and to look at us, Ana was a minor celebrity with some of the children). Urari’s emphasis is on fostering a connection between the tourists and the local community and we found friends and faces always nearby to talk with us throughout the day. Cocoa has a relevant importance in our people, it is used to make traditional medicines and when used during spiritual evening ceremonies it serves to purify our soul. Special consumption overnight is an ancestral practice Silico Creek. 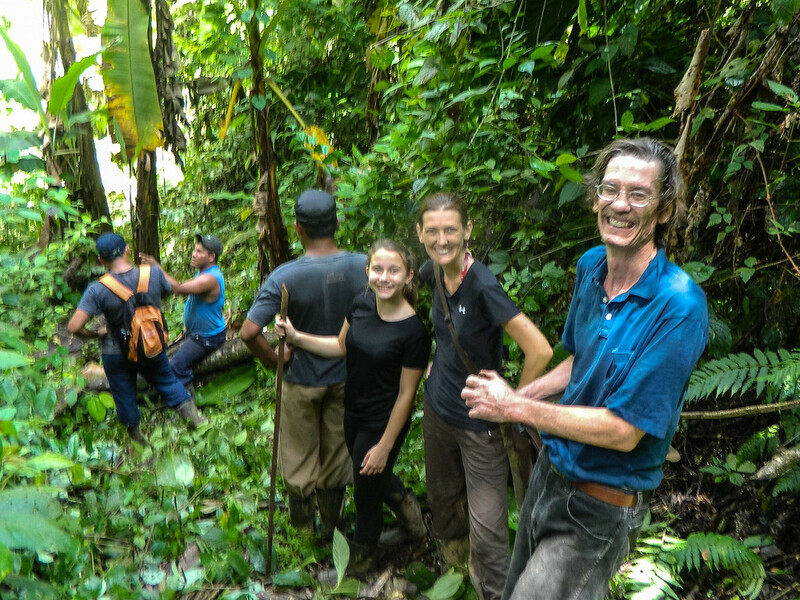 A steady rain drummed on our wooden bungalows our last morning at Silico Creek, and the wet earth created a deep mud through which we would trek to learn about Silico Creek’s primary cash crop: cacao. 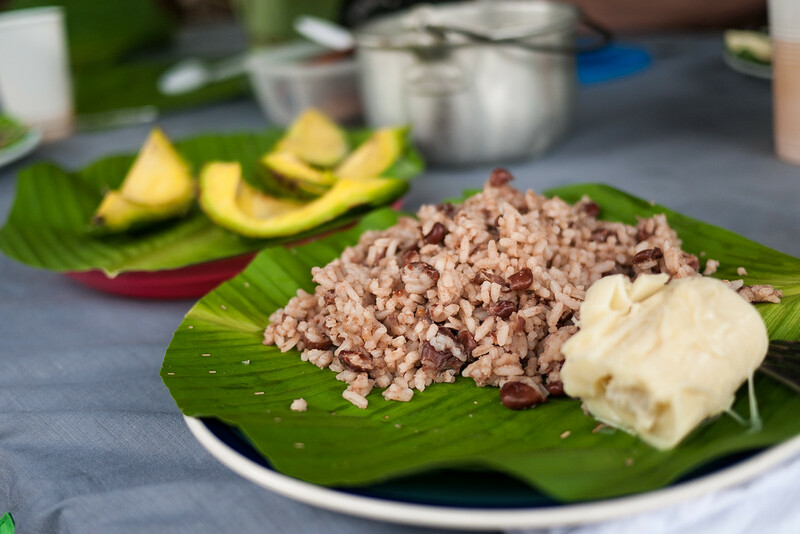 Throughout our visit, our meals included two traditional concoctions of this delicious bean—hot chocolate and chocolate coffee—and I was eager to visit the plantation and learn more about the cultural significance of cacao in the Ngöbe Buglé culture. The plight facing Urari again reminded me of the days I spent in the Akha Ama coffee collective in Northern Thailand … it’s a tale of farming, but also one of continually striving to meet international standards, keep the crops healthy, and find a fair outlet for the commodity. And while Akha Ama created a collective to directly connect their coffee to consumers, Urari sells the cacao to a cooperative, taking a small cut of the deep profits made from the global chocolate trade. 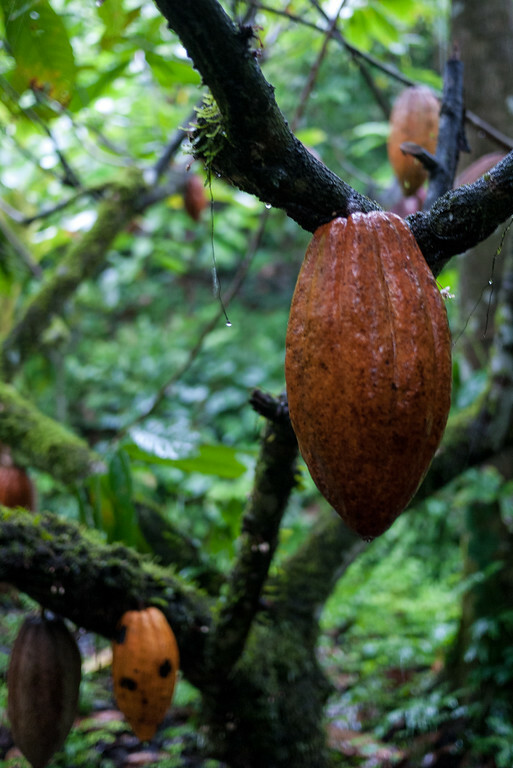 Instead of relying on selling their chocolate solely through the cooperative, which they have done since the 1950s, the families of Silico Creek plan to grow their tourism project and create a direct connection to tourists. 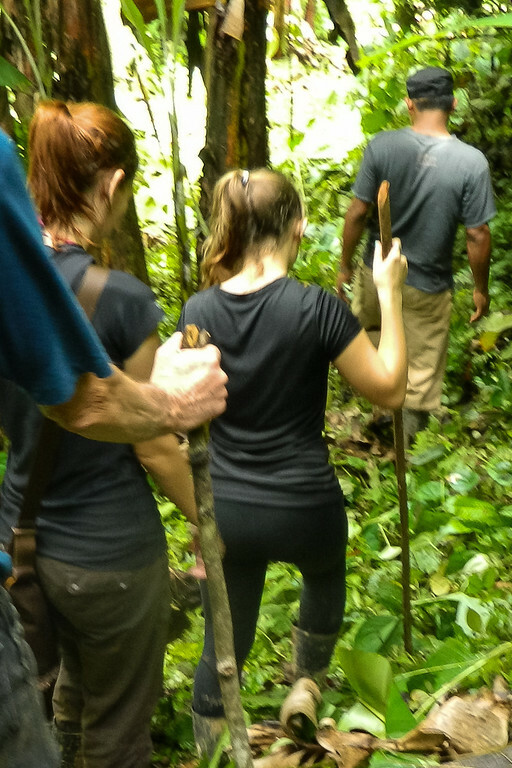 We slogged through the dense overgrowth in our borrowed rain boots and dodged the heavy cacao fruit hanging low from the trees. Arnoldo was our guide again, as well as the local farmer whose farm we were visiting. 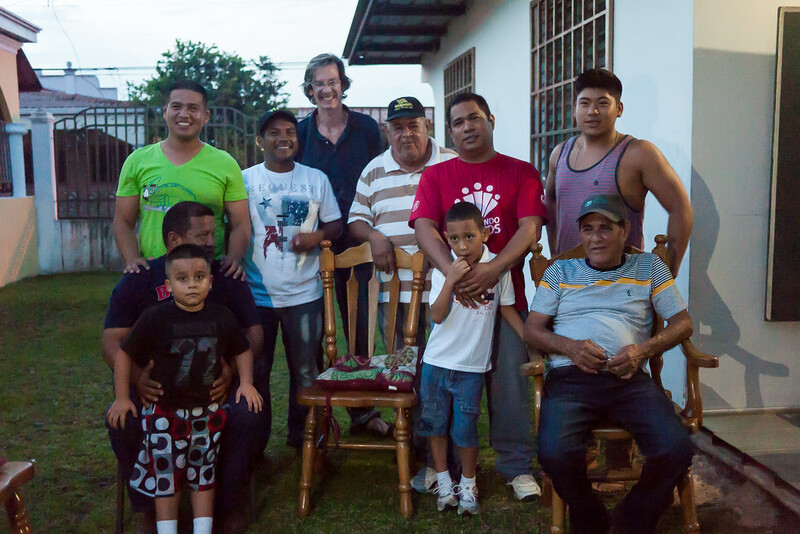 Between the two men, we learned the history of the crop and the core processes and challenges of growing cacao; we even tasted the ripe cacao fruit—syrupy sweet like candy. From there we walked back to the village and found shelter in the home of a woman who processes chocolate throughout the day. 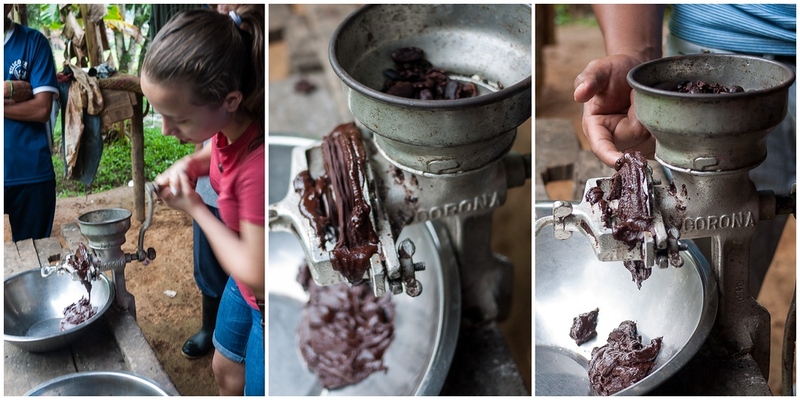 Most of the community’s adults, children, and artisans collectively run Urari, and 75 percent of the Silico Creek families are directly involved in producing and processing chocolate. I often talk about the benefits of local-level tourism, of supporting the communities working to support themselves and this is one of the clearest illustrations I have of the concept. And for that, I love Urari. But my threshold for basic is different from the average tourist because of my years on the road. Those three days at Urari were really my dad’s first venture into rural tourism, so I looked to his reactions with interest. Silico Creek hopes to continue expanding their initiative, and they are in the early stages. Right now school groups come en masse several times a year to study agriculture and farming, but the casual tourism from guidebooks and word of mouth is still in the early stages. And to an extent, you can tell. Western amenities are on the basic end. The outdoor bathrooms are spotless, but there is no electricity, mosquito nets adorn the beds, and you basically drop off the face of the earth while you’re staying at Urari—meals and activities are all arranged through the community and there is no easy access to the nearby towns. And it was great. My dad loved the three days. Although he was very glad for the hot shower in Boquete once we left, he loved having such direct access to the locals—a clear venue to ask questions and investigate his curiosity. This is what I have long loved about local-level travel and it was a success with all three generations of us on this trip—my niece (12 years old), me (29), and my dad (late 50s). The three of us and our guides for the three days! In stepping off the path a bit, comes the insights, stories and interactions that shape my most prominent travel memories. In addition to meeting locals at the markets, and striking up conversations with strangers in parks, it’s often by finding sustainable enterprises that I am able to meet people and learn their story. I travel with a specific interest in social enterprise and non-profit work, and by seeking out these conversations I find the other side of the tourist track. And for those with just a week or two in a region, grassroots initiatives run by locals allow locals to invite tourists into their communities on their terms and share their cultural, language, and customs. Sometimes travel to indigenous communities borders on zoo-like experiences (notably the Karen in Northern Thailand), but the face of modern tourism does not have to look like that. In fact, helping it not look like that is one of my missions throughout my travels and I strongly believe the interactions from grassroots, local-level travel had the strongest effect on shaping my own ethics and perspective. Come meet Ngobe Bugle, our culture, and see the importance of growing cacao organically. 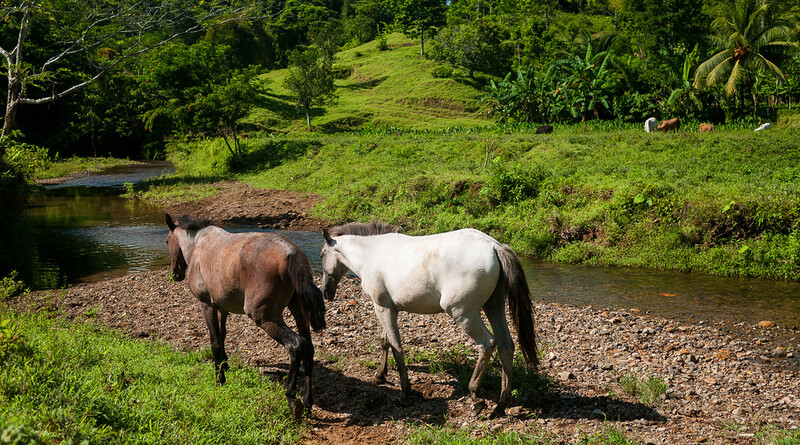 Visit the surrounding nature and tranquility to enjoy the company of a large family in rural area. 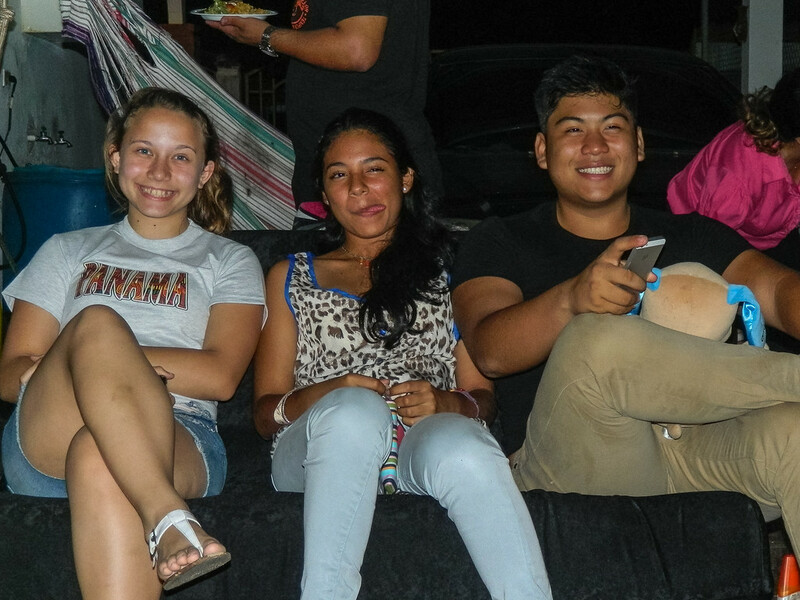 Through three days of full immersion I found new friendships, connected on a personal level with a culture so different from my own, and I did it on terms set by the people directly affected by my tourism—the families that make up Silico Creek, Panama. And that, well, that’s the heart of why I love social enterprise. A thanks to Mariane from AIME, a French organization working with Silico Creek to amplify and support their grassroots projects; she clarified many of the smaller details about the community, culture, and organization that I lost in translation. And a fond thanks and warm thoughts to all the members of the Aguilar family who opened their homes and allowed us a glimpse into their lives and their culture. Where: On the road between David and Changinola at kilometer 25. Full directions on their site; they would be best visited in conjunction with a Bocas del Toro trip as they are in that region, within the Ngöbe Buglé conmarca. How: Their website is pretty basic and great for research, but for the smoothest experience book the a bungalow on Booking.com (ALA readers get a discount if it’s your first time using the site! ), then reach out to the Urari community directly to pre-arrange tours and such during your stay. When: Urari is open to tourism throughout the year, though they have limited capacity to house tourists if a school group is in residence. We were there in June, which is off-season because of the rains, but that did not ruin the adventure by any means. 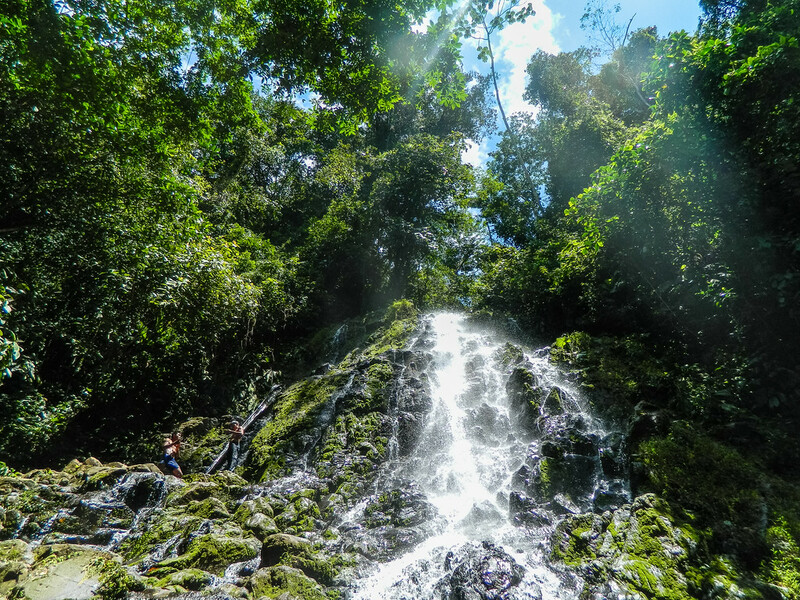 Book via email ahead of time and they will arrange your stay, prepare for the activities you want (waterfall hike, cacao tour, cultural dance, farm-stay, etc). We arrived five hours before they expected us, so of note is that they will try to meet you at the bus stop if you tell them of your arrival time. Why: Urari represents Silico Creek’s self-started initiative to create opportunities and revenue to sustain their community. Grassroots, sustainable projects are a passion of mine and all three of us loved the chance to immerse in the culture, ask questions, and learn more about the people while funneling money directly to the people. Tips: The accommodations are basic but very clean wooden bungalows, the bulk of the reservation does not have electricity (there is a small solar-powered station I heard about but never saw, so don’t count on using it). Bring flashlights, mosquito repellant, warm clothes, rain gear in the off-season, and a sense of adventure. Only a bit of English is spoken at Silico Creek (the man on the other side of the email address speaks fluent English), so you should have at least basic Spanish language skills. I was seven before I accepted that my parents had a life that existed before me, and in that year I remember a whole world opening up because I began to comprehend a world so much wider than what I had seen and experienced as yet in life. Though I am the rare breed of native Floridian, my parents are both transplants. My mom grew up in the Oswego area of upstate New York and my four older brothers were born there. My dad, on the other hand, approached life with the wicked New England accent inherited from my grandmother, but tempered with the 16 years he spent living in the Panama Canal Zone as a child. Stormy day views of the sprawling metropolis of Panama City from Fort Amador Island. In contrast to my rather staid childhood in a suburban neighborhood in the states, my dad spun tales of epic rotten-mango wars with his friends—a fruit so plentiful in the country he said it was impossible to eat them all. I lusted after the freedom and free range he was given to wander through forests filled with sloths, wild animals, and the untold mischievous adventures I knew he glossed over as he recounted them to me. And he got wistful when he talked about racing his mini motorcycle up and down the hills on the far side of the Miraflores locks. The same hills that we stood on together last month from an overlook, hills now excavated and buzzing with construction work on the country’s new wider canal system. You see, Panama was a special trip for me because it was a country I’ve heard about my entire life. And it was special for my dad because it was the first time he’s taken me there, taken me to see the memories, stories, and people from the first 16 years of his life. The most terrifying bridge I’ve driven across, the Bridge of the Americas, from Ancon Hill outside of Panama City. For the past three weeks back home in Florida, I’ve been processing the weeks my dad, my niece Ana, and I spent traveling through Panama. Unlike many places I visit, there was so much more to my trip than simply sightseeing or taking in the natural beauty of the country. We did all those things, and those stories will come, but our two weeks were framed by this nostalgia my dad carries with him for a country he left 40 years ago. There was a warmth and welcome in Panama that I’ve spent my whole life pondering. 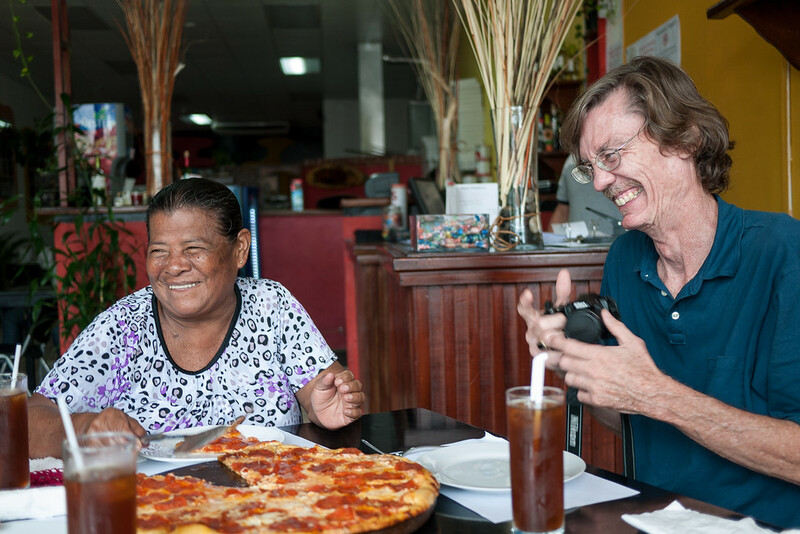 My dad traveled back to Panama a few times over the years and the surest reason I have always pinpointed was a love for the people still living there who shaped his childhood. 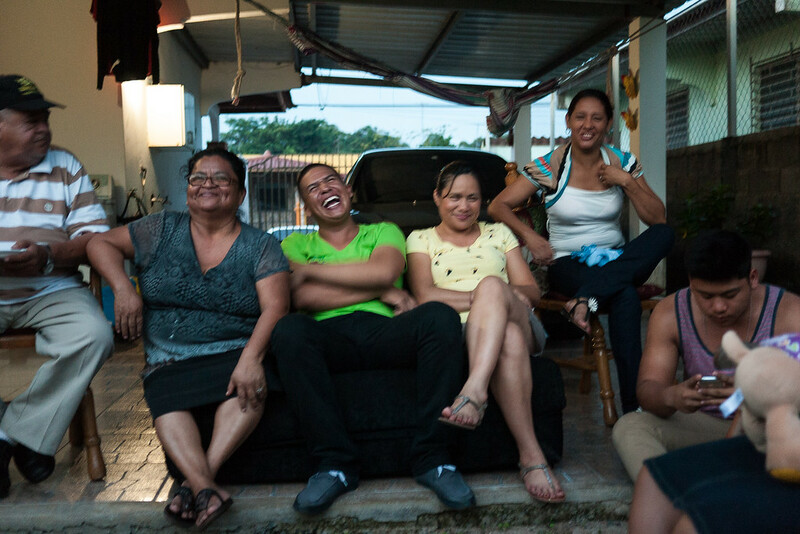 For throughout the stories were always peppered the key players in his life there, the two Panamanian sisters who worked for his family, Bernabela and Justina. My dad traveled back there when I was nine years old, and from that trip he brought home photos of him surrounded by people I had never met, everyone beaming smiles into the camera. Berna and my dad laughing at lunch over some story Berna’s granddaughter was telling! 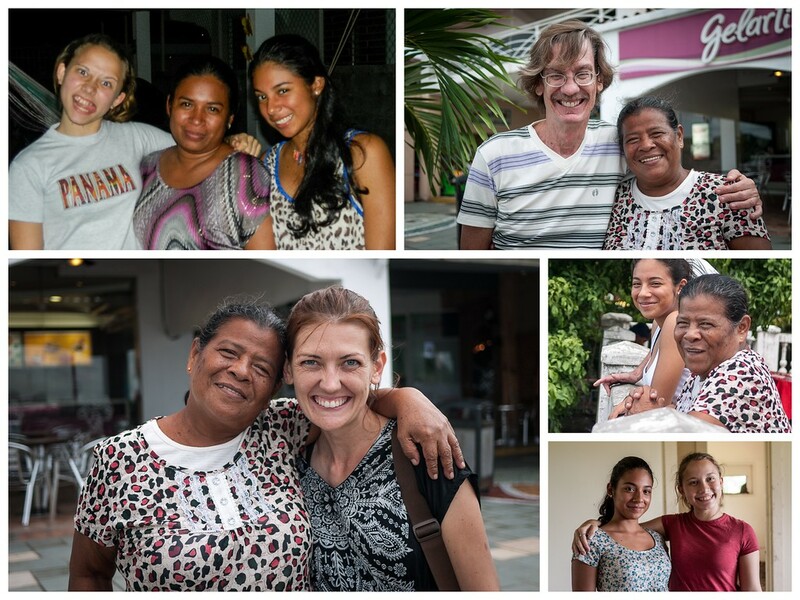 And 20 years after I first saw those photos, I linked those faces and stories with huge hugs of welcome. And in the overwhelm of introductions and hellos, all in Spanish mind you, it brought back the same cautious curiosity I had felt at the age of seven—my dad had a life and people connected to him that existed 1) before I was alive and 2) at a deeper level than had occurred to me in the self-focused bubble I walk around in. And these people made up an extended family I had never quite considered. I preface any future stories about Panama with this one because it most strongly shaped my memories of the country. Threads connect each of us to each other, and I don’t just mean the family bonds, or neighborhoods and cultures that appear on the surface of our lives. The interwoven story of humanity is one I’ve touched on before here, and it presented itself in the days spent visiting and reminiscing. I was connected to a place and a people and there were threads tying us to each other in ways I hadn’t considered. And because of these connections, Panama was so much more than yet another country added to my collection. 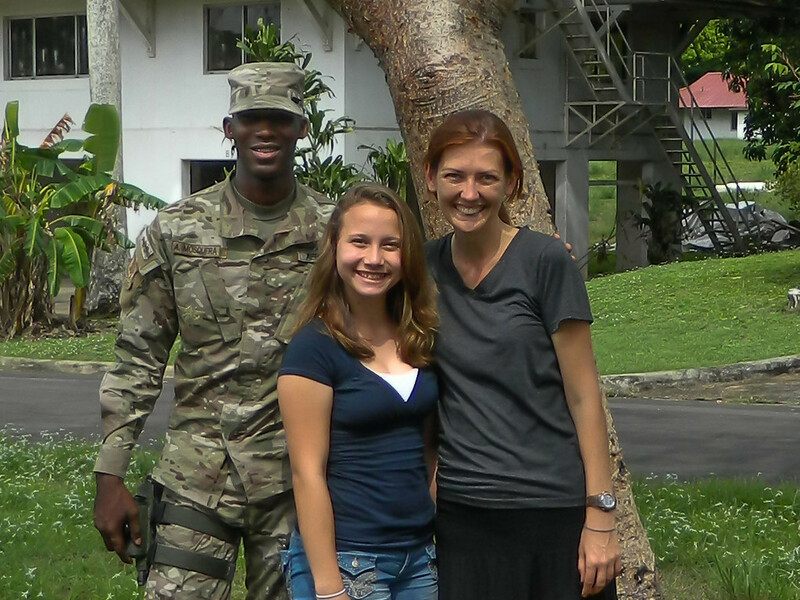 This soldier guarding the abandoned base seemed thrilled to have visitors. He peppered my dad with all sorts of questions he must have built up over the years, wondering who lived in which housing and what guy had earned the huge clapboard house on the hill (the military doctor). This was my dad’s apartment on the base growing up and we went for a visit with Berna and her granddaughter, who is 14 and made the perfect friend for Ana—the two got on swimmingly. Each one practiced the opposite language (Berna’s granddaughter spoke to Ana in English and Ana responded in Spanish; and they spoke the universal language of teens—selfies with their cell phone cameras). I so often travel solo, and I connect with new places over volunteer service or food. I ask for life stories, I consider how history has shaped the culture. My dad’s life in the Panama Canal Zone, and America’s involvement in the country in the ’60s and ’70s, took on a new meaning for me as we traveled to the old military base, and even more as I met the family and faces in the stories my dad had long shared with me over the years. The majority of the photos in this post deviate from the more traditional travel photos I usually share, but they were some of the more special moments from our last week in Panama with new friends and family, and with a whole lot of laughter since I was one of the primary translators for our mixed group (only Berna and myself could easily navigate the two languages; that made for hilarity as the number of family members grew and translations were needed). There is a distinct possibility this guffaw ensued after I translated something. The guys in our group. The teens held down the couch and did mysterious things together on their phones for most of the evening.